The fact that some people develop longer, more football shaped biceps, while others develop shorter, more mountain-like biceps is mostly a matter left up to genetics. 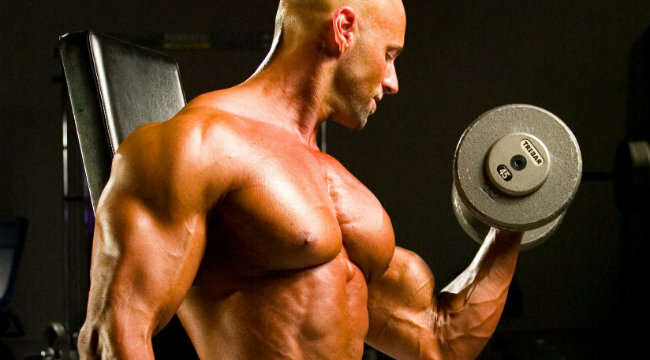 But do not fear, because there's a way that EVERYONE can create the illusion of having a more substantial biceps peak! The key lies in bringing about greater development in a little-discussed muscle that sits underneath the biceps called the brachialis. In a highly defined bodybuilder, the brachialis appears as a thick “knot” of muscle that pops out of the side of the upper arm when they are flexed and viewed from the rear. The cool thing about the brachialis is that as it grows larger, it will actually “push” the biceps up higher, which will give the appearance of a greater peak!